March is the start of spring… at least the start of hope for spring! In my neck of the woods – the greater Edmonton area – the winters are often long, so when March hits, we are all ready to pack away our winter gear and dig out our spring attire. Often it is not quite time… but even if the weather is not cooperating, Norwex is, by offering two great March Customer Specials to welcome in spring!! This special is a great package for kids. The Brown Bear Pet-to-Dry (read more) is made of super-soft chenille microfiber that is irresistible for little kids. It contains the exclusive Baclock™ in the cloth goes to work to self-purify and inhibit odors from bacteria, mold and mildew growth within the cloth. It is also super-absorbent and quick-drying so it can be used over and over. The cute animal motif and fun design helps win the battle of getting your kids to wash and dry their hands after using the washroom and creating an important life-time habit. You probably know that regular hand washing is the best defence against spreading disease and germs, but did you know that 95% of people fail to wash their hands long enough to kill the harmful bacteria on their hands? * To do so it takes 15-20 seconds (or the time is takes to hum “Happy Birthday” twice) of vigorous scrubbing with soap to properly clean your hands. The second item is the Vibrant Body Pack. It is a soft microfiber cloth, designed to clean and gently exfoliate skin with just water. Kids love the colours – pink, green and yellow – and can use them in the bath to clean their bodies or to wash the faces before bed. These clothes are perfect for delicate skin as well as problem skin as they gently remove excess oils for skin, are effective to help control acne and blackheads and can be part of your child’s daily hygiene routine. The Baclock™ agent in the cloth works to inhibit bacteria so that it can be used a few days before laundering. The third item is the Reusable Wet Wipes Bag, that is designed to carry your Vibrant Body Pack cloths when you are on the go. Kids are messy… that is a fact, you need something to clean faces and fingers, but traditional wipes have unnecessary chemicals and cause trouble in the sewer system if flushed and are disposable, causing unnecessary waste. Simply make the cloth damp and tuck it in the bag so it is ready to go when you face a messy face. The bag has a smaller pouch in front to tuck an extra cloth, or a Timeless Natural Hand Cleaner, or your lipgloss. That’s right, spring cleaning season is quickly approaching. This Power Pack special includes the top selling basic pack including a pink EnviroCloth and purple Window Cloth. 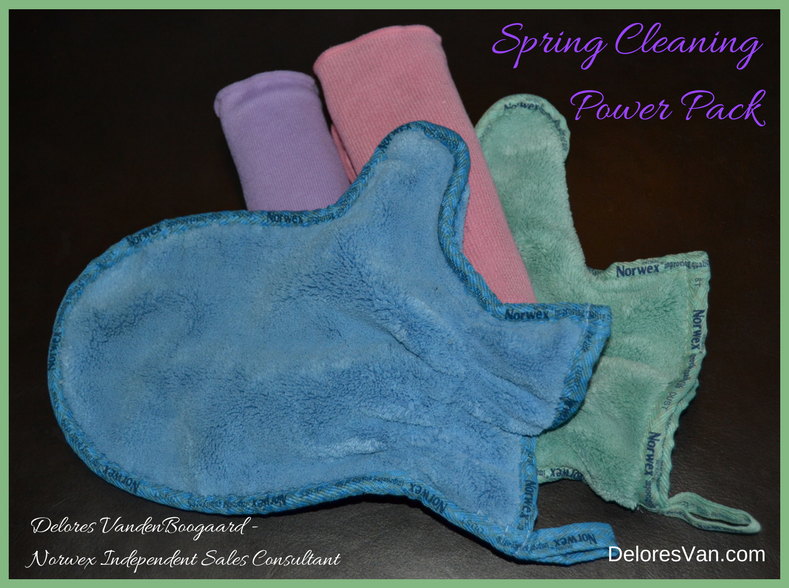 If you are familiar with Norwex, you will know that they are the perfect pair. The EnviroCloth, when damp and flat folded, can clean all the surfaces of your home. Then follow it behind with a WindowCloth to polish the surface, leaving them streak free, perfectly clean, without any chemical residue. Both cloths contain Baclock™ in the cloth – our micro silver antibacterial agent – goes to work to self-purify and inhibit odors from bacteria, mold and mildew growth within 24 hours. They are a radical way to clean your home that save time, money and the environment. The Power Pack also has two Dusting Mitts. Why two mitts? Because you have two hands and so you can get your dusting done twice as fast. These mitts have a thick, dense, plush fibers designed to use static electricity to attract and hold dust and allergens and not let go. They create a long-lasting clean because there is no ‘chemical muck’ or residue left behind by traditional cleaning products or polishes. Just to name a few, use them to dust: banisters, chandeliers, plant leaves, vents, fireplace screens, leaps and mini blinds. Clean by shaking vigorously outside or by using the Rubber Brush. Check out how your can clean your window screens… one of the best tips! Are you excited for spring yet? As you enjoy the change of season, take advantage of these Norwex specials to help make your housekeeping and spring cleaning more efficient and cost effective! Delores VandenBoogaard is an Independent Norwex Sales Consultant from Edmonton, Alberta Canada with customers and consultants throughout Canada and the United States including; New Brunswick, Nova Scotia, Quebec, British Columbia, Manitoba, Saskatchewan, Prince Edward Island, North West Territories and Ontario. She also has customers and team members in; Michigan, Texas, California, Massachusetts, Florida, Arizona, Missouri, Colorado, North Carolina, South Carolina, Idaho, Washington, New Hampshire, Iowa and Maine.